On April 15th, hundreds of Dana-Farber runners will take to the streets to participate in the 123rd Boston Marathon®. And I will be one of them! I am embarking on this crazy endeavor in honor and memory of the AMAZING, EXTRAORDINARY, EXQUISITE, Betsy (McDonald) Llanwarne. My friendship with Betsy began in elementary school. We played basketball together, worked on school projects together (one particularly incredible log cabin in 5th grade comes to mind), and played and sang together in band and choir. I somehow convinced her to do a civil war reenactment with me for National History Day, and we rocked our girl scout uniforms for years. She stood beside me on my wedding day, and my daughter, her goddaughter, was the flower girl at her beautiful wedding just this past August. While we both changed so much over the years, one thing remained constant – Betsy was the most remarkable person I had ever known. She was unfailingly kind, HILARIOUS, loving, and adventurous. 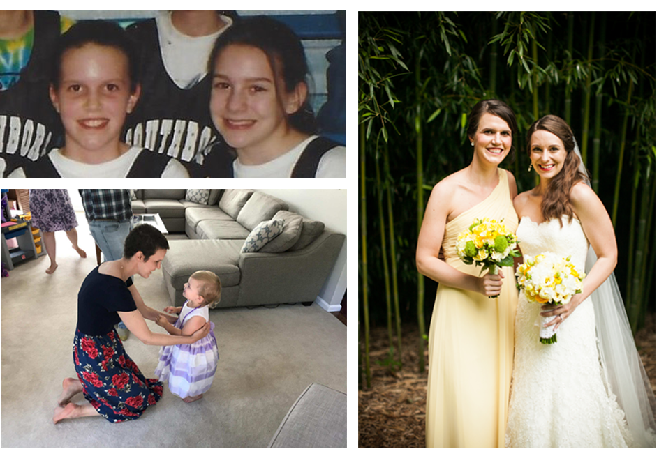 Two years ago, Betsy was diagnosed with a rare form of aggressive sarcoma. She embarked on a brutal battle that included radiation, countless chemotherapies and two surgeries. Despite her unsurpassed resolve, she lost this battle on October 24, 2018. I will always fiercely love this exceptional woman, and I will never stop missing her. Unsurprisingly, Betsy faced her diagnosis with tremendous courage and determination. She was resolute in her fight against this unrelenting disease, and she did it with the incredible care and commitment from the team at Dana-Farber. You couldn’t imagine a more compassionate or dedicated group of doctors and nurses. A team so close to Betsy that they even attended her wedding. You can learn a little more about her experience with Dana-Farber here. I decided to run for Dana-Farber’s Boston Marathon team because I needed to find some way to help. I couldn’t take Betsy’s chemo for her. I couldn’t develop a new treatment or drug. I couldn’t save her. But I CAN run 26.2 miles. I CAN raise thousands of dollars for the organization that is working so tirelessly to cure countless others like her. So that’s what I’m going to do.